From left: Reps. Tulsi Gabbard, Grace Meng, Ami Bera, Mark Takano and Judy Chu; judicial nominee Sri Srinivasan; Reps. Doris Matsui, Mike Honda and Alan Lowenthal. WASHINGTON — President Obama on May 23 issued a statement on the Senate’s unanimous confirmation of Srikanth “Sri” Srinivasan to be a judge on the U.S. Court of Appeals for the District of Columbia Circuit. “Sri is a trailblazer who personifies the best of America,” Obama said. “Born in Chandigarh, India, and raised in Lawrence, Kansas, Sri spent nearly two decades as an extraordinary litigator before serving as principal deputy solicitor general of the United States. Now he will serve with distinction on the federal bench. Sri will in fact be the first South Asian American to serve as a circuit court judge in our history. Srinivasan will be one of three Asian Pacific Americans sitting as federal appellate court judges in the nation. He earned his bachelor’s, J.D. and M.B.A. degrees at Stanford University. He previously worked for O’Melveny & Myers and has lectured at Harvard Law School. 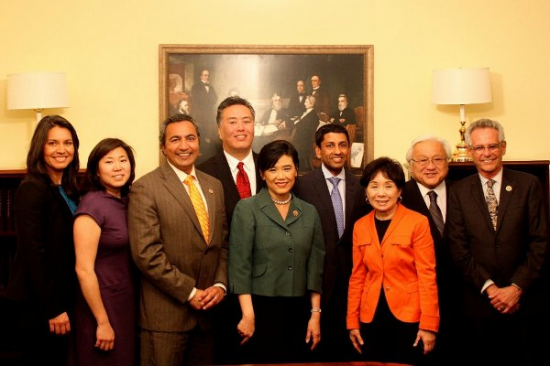 Members of the Congressional Asian Pacific American Caucus were pleased with his confirmation. Rep. Judy Chu (D-Pasadena), CAPAC chair: “His confirmation is especially timely since May is when we celebrate Asian Pacific American Heritage Month. Sri is a trailblazer for our community who brings a wealth of experience from his robust career in public service and the legal field. I thank Senate Majority Leader (Harry) Reid and my Senate colleagues for Sri’s swift confirmation, and I commend President Obama for his tremendous leadership in nominating highly qualified and diverse candidates for the federal bench.